FOREIGN ownership of Australian agricultural land rose by more than two million hectares in the past year, but the longer-term trend is reasonably stable, according to a report released by the Australian Taxation office. For the year ended June 30 2018, overseas owners had partial or outright ownership of 52.6 million hectares of farm land nationally, the report showed. While the foreign owned land area has risen compared to the previous 12 months, it was much the same as what it was in 2015-16 (see table). 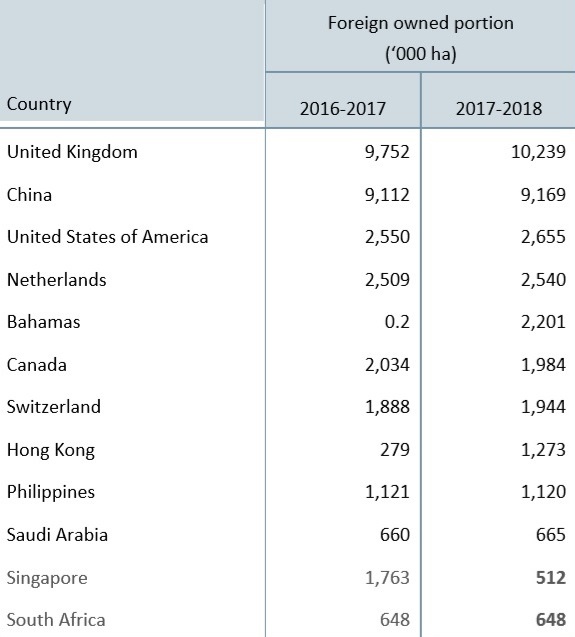 Not surprisingly, livestock industries accounted for the overwhelming majority of foreign agricultural land ownership, at just over 45 million ha, or 85pc of the total foreign-owned land. That figure has changed little in the past three years. Around 80pc of foreign-held agricultural land is held on a leasehold basis. The Register of Foreign Ownership of Agricultural Land was established four years ago by the Foreign Investment Review Board to provide greater transparency about the level of foreign ownership of Australia’s agricultural land. It’s important to note that some of the changes tracked in the most recent report, comparing 2017-18 to earlier years, can be attributed to adjustments in the way the data is collected. Much of this surrounds how the report treats a minority shareholding held by a foreign interest, versus majority or outright ownership. Previously, any foreign entity with a 20 percent or higher stake in a piece of agricultural land was included in the statistics, and apportioned the entire land area involved. For example, a UK minority shareholder with a 25pc interest in a million hectares of Australian farmland was credited with a million hectares of land. Last year, the process changed so a pro-rata allocation was made, meaning that UK entity would in this example be attributed with 250,000ha of land. The United Kingdom remained the largest foreign agricultural landholder in Australia last year, accounting for 2.6 percent of all Australian agricultural land. Next highest was China (2.3pc) and the United States (0.7pc). All three have moved only slightly higher in land area over the past two years (see table). Just two very large landholdings (the Australian Agricultural Co, which is now 46pc owned by UK billionaire Joe Lewis), and Consolidated Pastoral Co (owned outright by UK investment vehicle, Terra Firma), largely account for the UK’s dominant position on the list. Similarly, a large slice of China’s footprint can be apportioned to Shanghai CRED, Gina Rinehart’s partner in the S.Kidman and Co pastoral assets totalling 80,000sq km. Largest country of origin mover on the list last year was the Bahamas, which has moved from virtually zero land ownership the year before to 2.2 million hectares in 2017-18, taking position number five. As there has been no publicly-disclosed agricultural land sales to Bahamas entities in the past year, it is surmised that this entry represents a change in business address for a pre-existing foreign landholder, to the well-known tax haven. At the other end, Singapore declined dramatically in the extent of its ownership of Australian ag land, falling by 1.25 million ha last year to 512,000ha. Foreign entity restructures which have resulted in a change of the foreign entity’s status as a foreign person. There’s also clear evidence in the report of Australian domestic farming families and businesses re-purchasing land assets previously held by offshore interests. For example, South Australia showed a dramatic decline in the area of agricultural land held by foreign interests in the two years between 2015-16 (7.156 million ha) to 2017-18 (4.933m ha). Much of that can be linked to the sale of land previously held by foreign interests, now returned to Australian ownership. Based on comparisons with ABS data, the estimated proportion of agricultural land in Australia with at least 20pc of foreign ownership last year was 13.4pc. That figure has remained relatively stable over the past three years, at between 13.4 and 13.6pc. All states and territories showed increases in the amount of agricultural land with a level of foreign ownership, however the extent varied significantly across different regions. Both Western Australia (890,000ha) and the Northern Territory (951,000ha) recorded increases of 6.9pc in foreign ownership last year, while Queensland showed only a marginal increase, up by just 10,000ha or 0.06pc (see table). 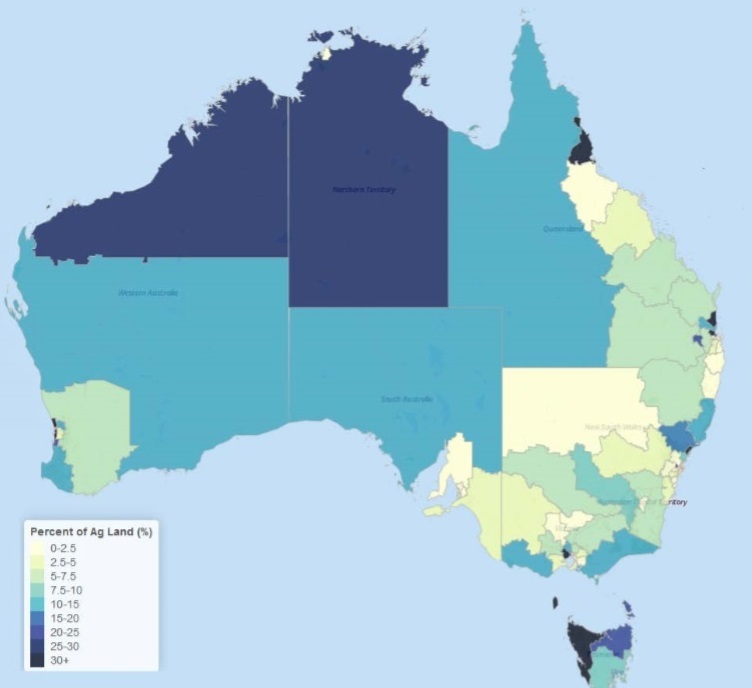 The report also included a breakdown of the proportion of foreign-held agricultural land on a regional basis, using ABS Statistical level standards (see map below). 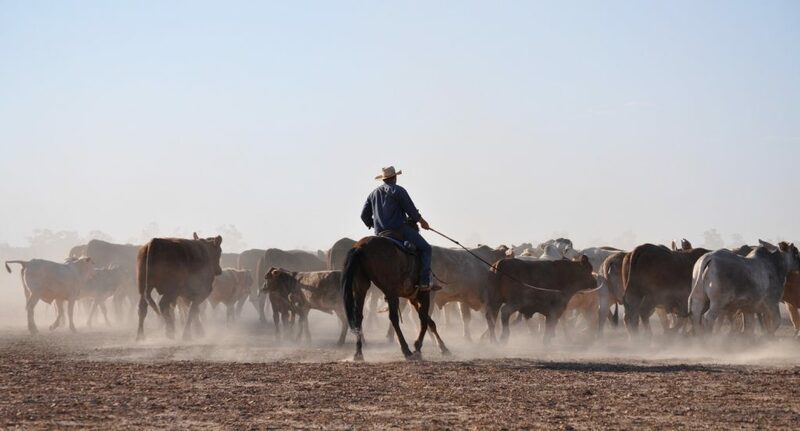 In November, Consolidated Pastoral Co (owned by UK institutional investor Terra Firma) sold its 852,00ha Nockatunga Station near Thargomindah in Queensland’s far west to Malcolm Harris and family’s Cleveland Agriculture. Last month, NSW-based stud Merino breeders Ian and Camilla Shippen paid $37 million for Mt Fyans, one of the largest and most highly regarded agricultural holdings in the Western district of Victoria. The Dundonnell grazing and cropping enterprise was previously owned by HAFCo, a Chinese/Australian joint venture. In October, Qatar-based Hassad Australia sold its Telopea Downs Station in western Victoria for $70 million to South Australian woolgrowers, the McBride family. Hassad has now sold about two thirds of its Australian farming and grazing assets, which earlier covered some 300,000ha in three states. Other properties currently on the market with foreign owners include 5000sq km Tanumbirini Station east of Daly Waters in the NT, which is being offered for sale by owners, Thames Pastoral Co, controlled by a UK investment fund. The Labor party last year indicated that if elected, it plans to expand the ATO’s annual report on foreign agricultural land ownership by identifying buyers of land, value and locations. “The register should set out for everyone to see not just the percentage of land owned by overseas companies but who has purchased it, where it is and how much they paid for it,” opposition trade spokesman Jason Clare said in September. The Federal Government is currently preparing a second foreign ownership register, this time for water access rights. The report is expected to be released in coming months.